A simple, small board game for toddlers (3 years and older) that I put together for children to play during Ramadan. Our game pieces are standing using the old game pieces holders from a long unused game. 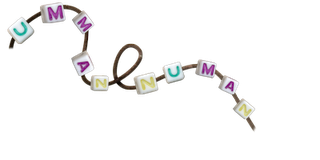 The purpose of the game is for parents to engage children in a dialog about the things that Muslims do during Ramadan. 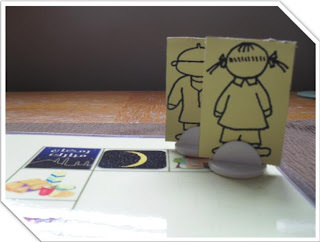 It is also helpful for parents to use the game as a springboard to help build vocabulary for toddlers by encouraging the children to learn the names of the spaces on the board (i.e. iftar, Quran, salat, suhoor, etc.). The game does not use dice to play as this is not permissible because of the report narrated by Imam Muslim -rahimullah - from Buraydah (may Allaah be pleased with him), according to which the Prophet (sallallahu alayhi wa salam) said: “Whoever plays with dice, it is as if he dipped his hand in the flesh and blood of a pig.” Imam An-Nawawi - rahimullah - said "what is meant by "it is as if he dipped his hand in the flesh and blood of a pig" is if he were to eat them, so this prohibition (on dice) is likened to the prohibition on eating (the flesh and blood of a pig)". al-Lajnah al-Daa’imah said that "it is not permissible to play with dice even if that does not involve prizes, especially if it distracts one from praying on time". You can read more here insha'Allah: Permanent Committee for Scholarly Research and Ifta'. - parents can help children decide who will go first (i.e. who knows the most Quran, listened to their parents well that day, etc.). - the first player to reach the masjid at the end of the board has the chance to win. Insha'Allah, on his/her next turn he/she recites the du'aa that we say when we enter (or the du'aa for when we leave) the masjid. Upon doing this correctly, the child moves their piece to the last square on the board that says, "Eid Mubarak" and they win. 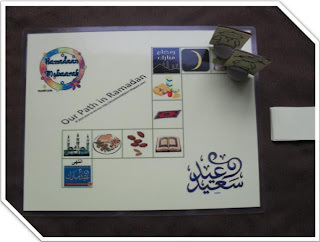 Some of the images are from Easel & Ink and the game pieces are images taken from Musalla.org. Alhamdulillah, I was told a few years ago that they have indicated that the images are free to use and are not under copyright...jazakum Allahu Khayran. Download the Arabic game version here insha'Allah. Download the English game version here insha'Allah. Download the game pieces here insha'Allah. As SAlaamu Alaykum, Lovely! I intend on printing! Insha Allah. Jazakallahu Khair! oh masha Allaah this is so cute, waiting to print this out and try with Maimoonah Insha Allaah. Jazzakillaah Khayr dear sis. jazak-allah once again for your creativity. 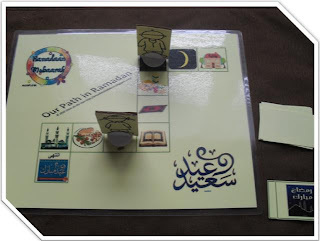 we've been using games/puzzles from yours as well as Umm Abdul Basir's site in our Ramadan Learning Centre. Insya-Allah will include this game in it too. Jazakum Allahu Khayran dear sisters. Insha'Allah, your children enjoy it *smile*. I printed this one out today. I did the board in black only to make it little more challenging matching it with the colored game pieces. As I was preparing to print my son was next to me and he said 'oh is that matching game'...so yeah I guess with the game pieces we can play a matching game too. This is versatile game...I guess it can be used in playing other ways then suggested. P.S. We received the books from the giveaway. They are awesome. I especially like the one were the child is thought about prayer times and colors and the child is being involved in looking for the colors that make up the picture. Jazakallah khair dear sister. Jazakillahu Khayr for the wondeful suggestion for an alternate way of playing! I think we'll try it that way today insha'Allah *smile*. Wa iyaki walhamdulillahi Rabbil 'alameen that you received the books! May Allah reward Smart Ark for generously sponsoring these lovely giveaways! I printed this resource out and laminated it to ensure durability. Before laminating the counter people, I asked my four year old daughter to colour them in. Alhamdulillah she had many questions regarding why there were no eyes on the girls and boys. She initially wanted to put facial features on but I explained the reasoning behind it and she refrained. Alhamdulillah since she has played this game she hasn't added facial features to any of her own drawings...we shall see if this remains once she starts nursery again! My 2.5 year old son also decided that the cards were good for playing snap...so I printed out a seperate set, enlarging the images to make child friendly size cards. Amazing how Allah has put so much knowledge in these little children. jzk so much sis for sharing such great resources with evryone. May Allah reward you and yours abundantly both in this world and the hereafter. Alhamdulillah wa jazakillahu khayr dear sis Marzana. I am so happy to hear about your daughter refraining from drawing facial features...may Allah keep her upon this path. And your four year old son...masha'Allah, it is amazing how much they teach us. I have to google to see what snap is. I am not familiar with this game.